How Do Social Security Disability Lawyers Get Paid Their Attorney Fee? 99% of Social Security disability claims whether they be SSDI (Title II – Social Security Disability Insurance) or SSI (Title XVI – Supplemental Security Income are handled on a contingency basis. The Social Security Administration will pay your attorney 25% of your past due benefits with a $6,000.00 cap. For example, assume you applied for benefits on June 1, 2017 claiming that you became disabled on January 1, 2017, and that you are entitled to an SSDI benefit of $1,200.00 per month. Now, further assume that you are before an administrative law judge (ALJ) on June 1, 2019, and he or she agrees with you that you were indeed disabled on January 1, 2017. If that were the case, you do not get back benefits for the first 5 months of disability, and the Social Security Administration would thus owe you 24 months of back benefits or $28,800.00. The Social Security Administration would withhold $6,000.00 from your past due benefits to pay your attorney, and then release the remaining $22,800 to you before beginning regular monthly payments of $1,200 per month. 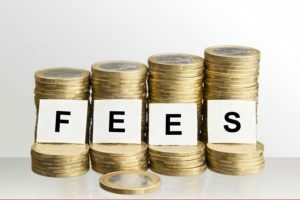 Separate from the attorney fee, you may owe your attorney a few hundred dollars to cover the costs associated with the pursuit of your claim. The costs in a Social Security disability claim rarely exceed $500.00 and are usually around $250.00 or less.